SUMMARY: Hurricane Nate made a first U.S. landfall near the mouth of the Mississippi Rover just before 7pm Saturday. 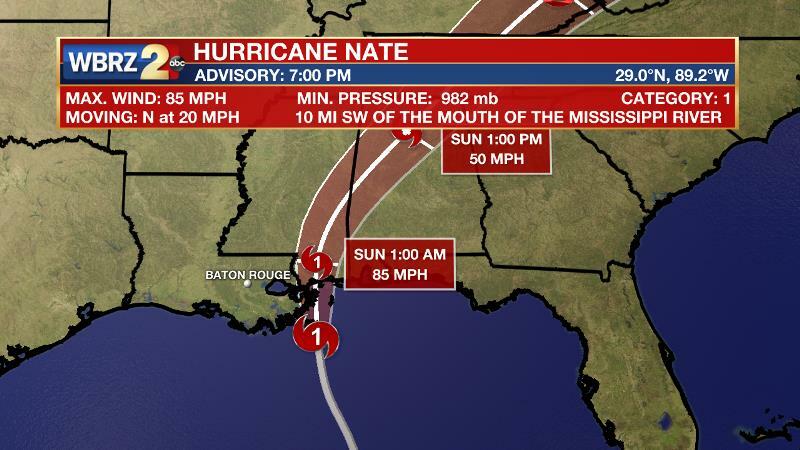 As of 7pm Saturday, Hurricane Nate was located 100 miles south of Biloxi, Mississippi with a minimum central pressure of 982mb and maximum sustained winds of 85mph and was moving north, north at 20mph. After making a landfall near Gulfport, Mississippi, Saturday evening, Nate will accelerate northeastward with wind and rain quickly ending on the southern side of the storm Sunday morning. Storm surge of 7 to 11 feet between the mouth of the Mississippi River eastward to the Mississippi/Alabama line will gradually recede Sunday. The following information is for the WBRZ Weather forecast area including Ascension, Assumption, East Baton Rouge, West Baton Rouge, Pointe Coupee, Iberville, Livingston, East Feliciana, West Feliciana, St. Helena, St. James, St. Mary and Tangipahoa Parishes as well as Amite, Pike and Wilkinson Counties. If you need information outside of these areas, visit the National Weather Service. If you would like to view the detailed hurricane local statement, CLICK HERE. 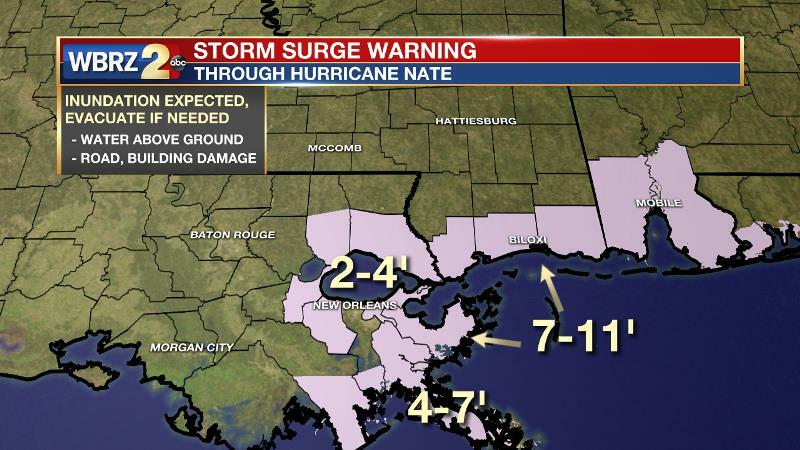 Impact to the Baton Rouge Metro area from Hurricane Nate is expected to be minimal with the exception of Gulf and lake shorelines where there is a threat for storm surge. See below for a full description of potential impacts. Hurricane Nate will race away from the region on Sunday morning and conditions will improve quickly. Overall, Sunday is still looking rather gloomy, though an improvement over any conditions experienced due to Nate. Look for mostly cloudy skies with an isolated shower or thunderstorm possible. 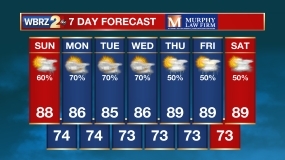 It will still feel very tropical and humid with highs in the upper 80s. More of the same is expected for Monday and Tuesday with highs in the upper 80s, lows in the mid 70s and daily showers and storm remain possible. Unfortunately, the cold front we had been advertising for the middle of the week is looking much less impressive. While a front will pass, the temperature drop will not be significant only reducing highs and lows by a degree or two. Some lower humidity is expected though and that will feel better. ALERTS: A *TROPICAL STORM WARNING* has been issued for parts of the WBRZ Weather forecast area including northern Tangipahoa, Livingston, Ascension, Assumption and St. James Parishes. Where more significant storm surge is expected, a *HURRICANE WARNING* has been issued for southern Tangipahoa Parish south and east through New Orleans to coast. SURGE: High water will continue on shorelines and The National Weather Service has issued a *STORM SURGE WARNING* until Sunday evening due to this threat. Water levels could reach 1 to 3 feet above ground on the shore of Lake Maurepas, 2 to 4 feet above ground on the shore of Lake Pontchartrain, 4 to 6 feet above ground from Grand Isle to the mouth of the Mississippi River, and 7 to 11 feet above ground from the mouth of the Mississippi River eastward to the Mississippi/Alabama border. 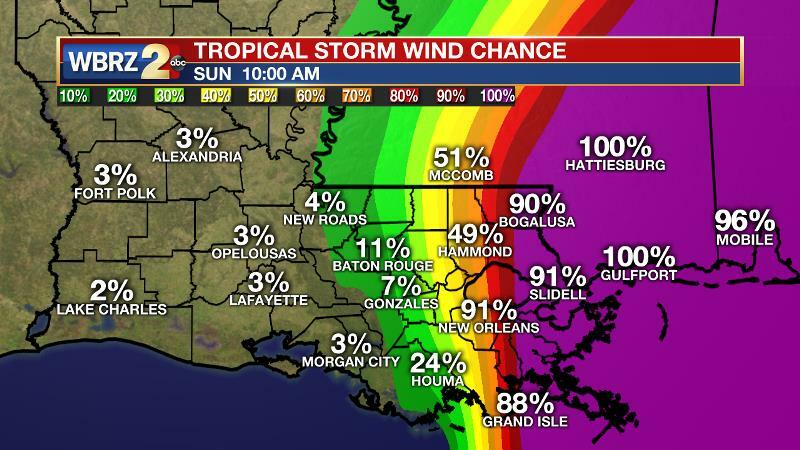 WIND: The chance for tropical storm force winds is minimal in the WBRZ Weather forecast area, with a 50 percent chance of winds over 39mph in Hammond down to less than 10 percent chance for Baton Rouge and points to the west. 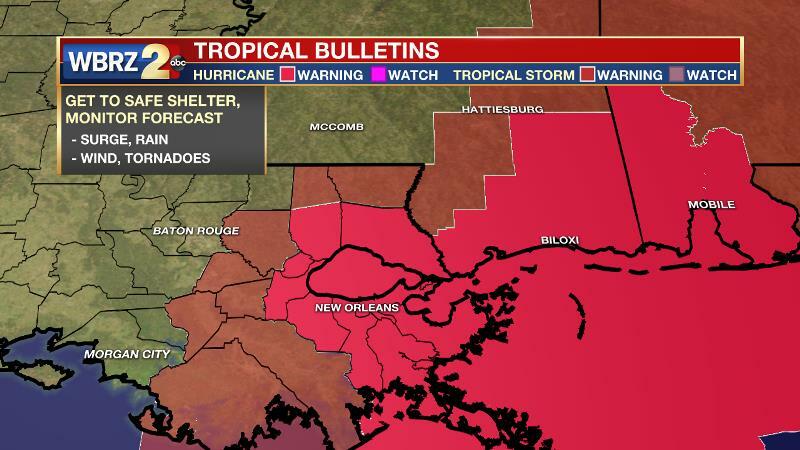 New Orleans and areas east have a greater than 90 percent chance of winds over 39mph. RAIN: Nate will be a fast mover. Therefore, 1 to 3 inches, and possibly less, appears to be possible over the weekend with the lowest amounts near the Atchafalaya Basin and isolated higher amounts eastward toward Mississippi. Additionally, the threat for tornadoes should be lower in the Baton Rouge area than states east. ACTIONS: If you have coastal property in Louisiana, Mississippi or Alabama, wait until Sunday afternoon when the water has receded to return and evaluate. Your calm in the storm, the WBRZ Weather Team is here for you, on every platform. Your weather updates can be found on News 2, wbrz.com, and the WBRZ WX App. on Apple and Android devices. For new storm advisories as soon as they are issued at 1, 4, 7 and 10 am/pm follow WBRZ Weather on Facebook and Twitter.